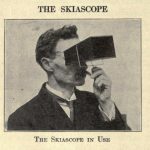 Benjamin Ives Gilman invented the skiascope to ensure that museum visitors saw art as he thought best—without distraction. Unfortunately, as far as I was able to determine, no skiascope survives. And so I built one.